The Innova Group was instrumental in creating solutions to enable the HSC to upgrade its infrastructure, plan for growth in demand for its services, integrate more effectively with the community, and realize the potential of its substantial presence in the city of Albuquerque. The University of New Mexico Health Sciences Center (HSC) is the state’s largest academic health complex, combining education, research, patient care, and community outreach. The campus comprises both academic and clinical entities including the nursing and pharmacy colleges, medical school, library, UNM Hospitals, and cancer research and treatment center. Faced with growing service demand, diverse stakeholder goals, and aging infrastructure, HSC turned to The Innova Group, in partnership with Dekker/Perich/Sabatini and Ellerbe Becket, for facility master planning expertise. The scope of the overall project necessitated a multi-scale approach to be implemented through several phases. 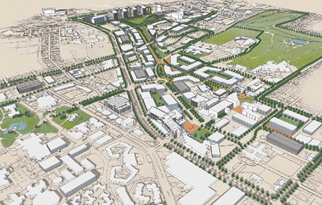 The Innova Group was engaged as a partner in an integrative urban design process for the HSC campus that aimed to maximize green open space, develop districts based on usage patterns, improve accessibility for patients, and consolidate clinical services. As part of this effort Innova developed market volume projections that determined service line and departmental space requirements, yielding ideal building sizes; provided design support; and created a detailed implementation schedule for each phase of the project.